What Do You Do With an Orchid When it Is Finished Flowering? Orchids produce flowers that keep their bloom for months, making this brightly colored flower a good choice for a houseplant. Its colors and patterns liven up any room of the house. However, once the orchid loses blooms, the plant still requires care if it is to bloom again in the future. The orchid’s stem provides nutrients to the roots after the plant loses its blossoms. Waiting to trim the stem until it is completely dry avoids depriving the orchid of food. Use sharp scissors or a knife to cut the stem close to the soil and dispose of the cut portion. If the orchid is a moth orchid, only trim the stem halfway, as this type orchid blooms multiple times on one stem. An orchid does not go dormant after shedding its blossoms. It still requires moisture to continue taking in nutrients. Allowing the top inch of the potting soil to dry out before watering the orchid prevents drowning and fungal growth from excess water. Dormant orchids require less water than active flowers. Make sure the planter or pot drains water from the bottom so that the orchid is not growing in saturated soil, which drowns the roots. Although the orchid appears dormant after losing its blossoms, the roots still take in nutrients from the surrounding soil to support the plant during its dormant period. Keep the plant supplied with nutrients ensures the blossoms return. Orchid fertilizers are available at many gardening centers. Adding orchid fertilizer to the planter every two weeks according to the manufacturer's directions keeps the soil and the orchid healthy. The amount of sunlight an orchid requires varies depending on its species. Keep the orchid where it receives the appropriate amount of light, even when it is not producing flowers. Too little light stops the orchid from growing again, while too much light damages the flower, scorching leaves or preventing blossoms. 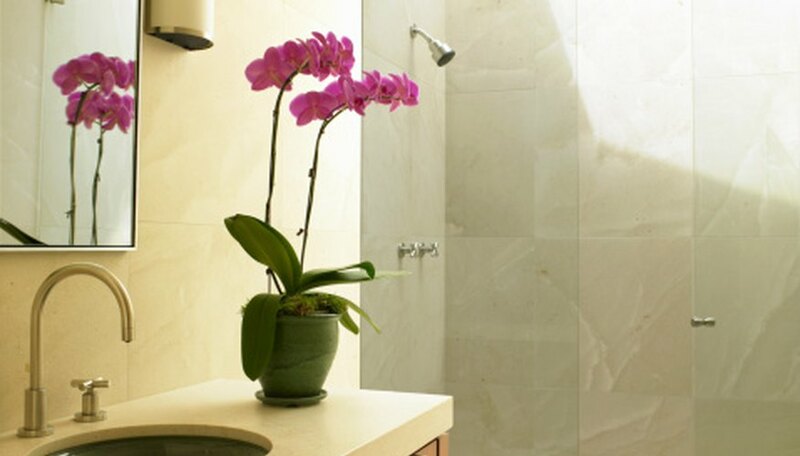 Keep the orchid where it will receive natural sunlight or provide the flower with an artificial grow lamp. University of Tennessee; Growing Orchids in the Home; Linda M. Seals, et al.